A case can be made that those who suffer the most from never-ending immigration are the most recently arrived aliens. NPR, in a piece that ostensibly intended to highlight an alleged labor shortage, instead proved how continued high immigration is bad for, among others, the newest immigrant arrivals. 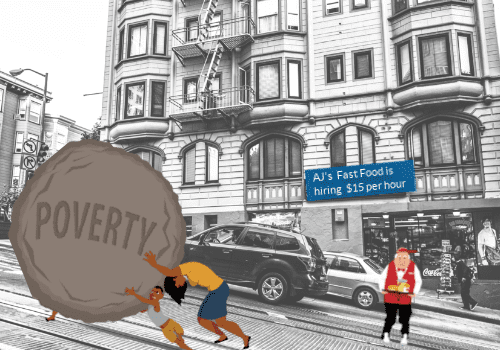 In her story titled “Bay Area’s High Cost of Living Squeezes Restaurant Workers, Chefs and Owners,” NPR reporter Jasmine Garsd relates Armando Ibarra’s grind to survive in San Francisco. Briefly, Ibarra has been sleeping in the back of his van for a couple of years, then walks to his job at a chain hotel near the San Francisco Airport where he showers, drinks coffee, has a smoke and proceeds to his job as a food runner. Ibarra says that he, like everyone else earning the princely sum of $15 an hour, can’t afford to live in San Francisco where a one-bedroom apartment rents for $3,000 a month. Before sleeping in his van, Ibarra moved in with his mother in San Jose, and paid her $800 monthly. But the four-hour, bumper-to-bumper round-trip commute to his job site got the best of Garsd. Since he was already spending four hours in his vehicle, Garsd figured he might as well sleep in it. After sharing Ibarra’s lifestyle, the reporter talked about how a worker shortage forced many local restaurants to close or resort to automation, generating $6 hamburgers. As for Ibarra, he eats at Taco Bell, Burger King or the nearest gas station. The story doesn’t reveal Ibarra’s immigration philosophy. But one immigration outcome is certain: more immigration means more job competition for Ibarra when he seeks to advance. Or, more dire, Ibarra could lose his job to the newest immigrant arrival who is eager and willing to work for less. To illegal immigrants without options, any job is better than none. Given the real estate market in and around the Bay Area, Ibarra could live in his van for a long time. For years, solving the affordable housing crisis has been a Sacramento rallying cry. In 2017, Gov. Jerry Brown signed a package of 15 affordable housing bills that cleared the California Assembly. Brown’s successor, Gavin Newsom, proposed in his budget that $1.75 billion be earmarked for affordable housing. Newsom called his concept a housing Marshall Plan. But, “there’s many a slip twixt cup and lip.” How many low-cost houses might actually be built, and whether they’ll be constructed in enough time to help Ibarra or the tens of thousands of other homeless Californians, is anyone’s guess. Wagering Californians, having seen the catastrophic, bottomless bullet-train-to-nowhere money pit that was projected to eventually light a match to more than $77 billion, aren’t holding their breath. Little wonder they’re skeptical. According to the California Housing and Community Development Department, 526 cities failed to meet their housing goals. Ibarra and the other tens of thousands of homeless Californians are unlikely to ever move into an affordable home. California has roughly one-quarter of the nation’s chronically homeless. In the meantime, hundreds line up at the Southwest border, some of whom would welcome an opportunity to work on the cheap as a food runner, Ibarra’s job, and to have a roof over their heads. But development, even if it starts tomorrow, can’t keep up with California’s population growth. By 2050, California’s population will hit 50 million, up about 25 percent from today’s 40 million, and most of the growth is immigration-driven. Imagine already-bursting-at-the-seams cities, including Los Angeles, San Jose, San Francisco and Sacramento, with a 25 percent population growth, and you’ll be imagining a very ugly picture. For California, already at the breaking point, the next few years will be pivotal. To save California, a tall order that may be beyond reach, federal and state leaders will have to do a 180, and work toward a sensible, sustainable immigration level. But, to quote another old line, perhaps things will get worse before they get better. This entry was posted in Featured, H1-B News, Immigration Issues, Immigration News, Immigration Topics and tagged affordable housing, bullet train, california, cheap labor, homeless, overpopulation. Joe Guzzardi is a nationally syndicated newspaper columnist who writes about immigration and related social issues. Joe joined Progressives for Immigration Reform in 2018 as an analyst after a ten-year career directing media relations for Californians for Population Stabilization, where he also was a Senior Writing Fellow. A native Californian, Joe now lives in Pennsylvania. Contact him at jguzzardi@pfirdc.org.